According to Research in Motion (RIM) executives, all BlackBerry service has been restored following the largest network outage in that smartphone’s history. The outage started earlier this week in Europe and spread to North America, Asia, Africa, the Middle East and South America over the course through yesterday. It appears that a failure at one of the company’s messaging servers in Europe was what set off a domino effect that reportedly caused problems for millions of BlackBerry owners. “We’ve now restored full services,” RIM’s co-CEO Mike Lazaridis told reporters. Some BlackBerry users may still see e-mails coming in slowly as the system recovers, he said. The major outage frustrated customers on nearly every continent who were unable to send and receive e-mails and text messages this week. It also comes at a bad time for RIM, which is facing increased competition from Android and Apple smartphones. A sad day here in the Silicon Valley and around the world as news spreads about the death of Apple co-founder Steve Jobs. Jobs invented some of the world’s most popular gadgets that have transformed everyday technology, from the personal computer to the iPod, iPhone and iPad. He was 56 years old. Mr. Jobs had waged a long and public struggle with cancer, remaining the face of the company even as he underwent treatment. He continued to introduce new products for a global market in his trademark blue jeans even as he grew gaunt and frail. He underwent surgery for pancreatic cancer in 2004, received a liver transplant in 2009 and took three medical leaves of absence as Apple’s chief executive before stepping down in August and turning over the helm to Timothy D. Cook, the chief operating officer. When he left, he was still engaged in the company’s affairs, negotiating with another Silicon Valley executive only weeks earlier. According to a letter which was distributed to Apple employees, Apple CEO Steve Jobs is taking leave of absence from the because of a medical condition. This marks the second time in two years that Jobs will be taking time away. “At my request, the board of directors has granted me a medical leave of absence so I can focus on my health. I will continue as CEO and be involved in major strategic decisions for the company,” Jobs says in the letter. Holiday Greeting Cards? There’s an App for That! iPhone, iPad and iPod Touch users…listen up! 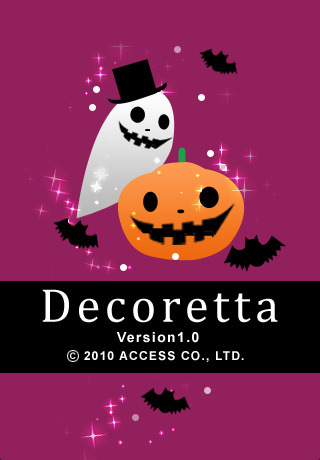 Our client ACCESS has a cool, new Halloween app called Decoretta which is now available on the App Store for just $.99. There is also a free version available, Decoretta Lite. With this application, you can send anyone, anywhere in the world, a greeting card simply by using your iPhone. For Halloween, Decoretta is filled with templates featuring ghosts, pumpkins, gravestones and haunted houses. Why spend the time going out, picking out a card, buying a stamp and mailing it! With Decoretta, getting your holiday greeting cards is fast, easy and painless! Decoretta works between iPhones, iPod touch and iPads. In case you’re wondering, Decoretta isn’t just for Halloween. It will be updated for every holiday so you’ll be able to send greeting throughout the year from your iPhone for Christmas, Valentines Day, Easter and more! Be sure to download the app and let me know what you think. Happy Halloween! Apple: Free Bumpers All Around! Apple’s Steve Jobs announced that the company will give free protective cases to buyers of its latest iPhone model to alleviate the “death grip” problem. CEO Steve Jobs made the announcement (click here for the live blog) during a press conference at Apple’s headquarters in Cupertino, Calif., Friday morning in response to a public-relations crisis over signal issues reported with the iPhone 4, which was unveiled in June. iPhone 4 owners will apply for the free bumper (a case that protects just the outer rim of the phone) online at Apple’s Web site, and owners who already purchased a bumper will get a full refund, Jobs said. After days of being pilloried for the iPhone 4’s antenna problems, Apple CEO Steve Jobs took to the stage in Cupertino, California to respond. Jobs announced during the iPhone 4 press conference Friday that every iPhone 4 user will get a free Apple Bumper to help mitigate antenna problems. This will apply to every user who buys an iPhone through September 30. iPhone 4 owners who have already purchased one of the $30 bumpers will get a full refund. Users who don’t like the bumper solution and are still unhappy with the iPhone can bring it back for a full refund instead. Apple will offer free cases to past and current iPhone 4 customers through September 30, and is offering a full 30-day refund to customers who have had signal loss issues with the iPhone and no longer want it. “We’re not perfect, and phones aren’t perfect either, but we want to make all of our users happy,” Apple CEO Steve Jobs said. Friday’s announcement follows a recent Consumer Reports blog post in which they said they could not recommend the iPhone 4 because of problems with the antenna located on the bottom left of the device. “We’re not perfect, phones aren’t perfect. But we want to make all our users happy.” And with that uncharacteristically humble introduction, Steve Jobs offered what passed for Apple’s apology to iPhone 4 users who have encountered reception troubles and said they would receive free bumpers. Authorities seized a variety of items, including computers and digital cameras, from Gizmodo editor Jason Chen last Friday evening after he posted pictures and details of a lost iPhone prototype. Check out Gizmodo for copies of the Search Warrant documents. So…what happens next? Will Gizmodo and Chen face the wrath of the police for purchasing the device? A computer-crime task force made up of multiple law enforcement agencies searched Gizmodo editor and blogger Jason Chen’s house and car in Fremont, Calif., on Friday, according to a statement and search warrant documents provided by Gizmodo. Gizmodo, the technology blog that recently published details about Apple’s next-generation iPhone after paying $5,000 to get its hands on the device, posted documents today showing that police raided one of its editor’s homes. A search warrant posted by Gizmodo says police on Friday seized computers, cameras, hard drives, business cards and computer servers from the home of Jason Chen, the site’s editor who last week published details about Apple’s unreleased smartphone. The warrant, issued by a judge in California’s San Mateo County, says police were able to raid Chen’s home because they had reason to believe his computers were used to commit a felony. The warrant makes specific reference to the unreleased iPhone 4 and gives police the authority to look for e-mails and other documentation related to the gadget. Twitter creator Jack Dorsey has provided the public with the first public demonstration of his hotly-anticipated latest venture. The new venture is a device that will allow credit card payments by cell phone. And here’s the best part: it’s free!